Tucked away next to a busy side street in Rome is an unassuming building, the Chiesa del Gesù (Church of the Gesù), which, aside from the Jesuit IHS symbol above the door, shows few outward signs of the important history contained within its walls. The Church of the Gesù, the mother church of the Jesuits, wasn’t established until 1568, but that didn’t stop St. Ignatius of Loyola, the founder of the Jesuits, from setting up shop at a site next door. Ignatius had dreams of a mother church for his new order, but the Jesuits wouldn’t have the money to start the project until more than a decade after he died. Connected to the Gesù, accessible by a separate door and a maze of plain white hallways, are a handful of modern offices and, importantly, several rooms where Ignatius spent the last decade or so of his life. It was there, in the rooms of St. Ignatius, that I and 29 others affiliated with Creighton University, spent our first afternoon in Rome, having already visited a number of other important sites in Spain on a summer pilgrimage following the footsteps of Ignatius and the early Jesuits. 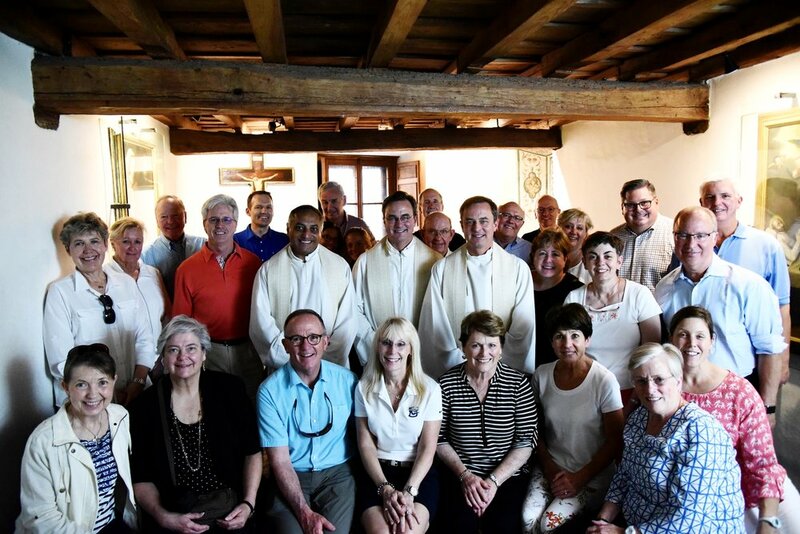 Although this wasn’t the last day of our pilgrimage — that would come with Mass at St. Peter’s and a meeting with Rev. Arturo Sosa, S.J., the Superior General of the Society of Jesus, a few days later — there was a certain poignancy during our visit to the rooms of Ignatius. Here, more than 450 years after Ignatius died, we were celebrating Mass in the very room where Ignatius prayed, managed his growing order in its early days, penned some 7,000 letters to people around the world, and ultimately passed away. Lining the walls around our celebrant, Creighton’s president, Rev. Daniel S. Hendrickson, S.J., were members of Creighton’s Board of Trustees, a handful of Creighton’s leaders (including Provost Tom Murray, Ph.D.), and other friends of the University, many of whom have advised Creighton’s Board or served as members in the past. What everyone in this room had in common is that they had chosen to be there: to offer up their own time and resources in the interest of learning and growing closer to Creighton’s Catholic and Jesuit roots. Our group didn’t go everywhere Ignatius went throughout his life. He had, for example, studied in Paris at the Sorbonne, and made a pilgrimage to the Holy Land, both of which we had to cut out of our itinerary due to time constraints. Still, we saw many key sites. On Monday, three days before visiting the room where he died, we visited the manor at the Loyola Shrine in Spain, where Ignatius was born and grew up, before seeing a nearby chapel where he prayed regularly, and a hospital where he ministered to the sick. Throughout our journey, we also visited sites such as the Benedictine Abbey of Montserrat, home of the Black Madonna before which Ignatius laid down his sword; the cave at Manresa, where he wrote the Spiritual Exercises; and Our Lady of Pilar, a stop on Ignatius’ own pilgrimage. There were several differences between our pilgrimage and Ignatius’, of course. Where we had the luxury of transcontinental flights and a bus to shuttle us from site to site, Ignatius had walked the world from one chapter of his life to the next. Without the benefit of travel by air or by car, or even a symmetrical gait — one of Ignatius’ legs became shorter than the other after he was badly injured as a soldier — Ignatius had, remarkably, covered thousands of miles over the course of his life in search of his place in the world. Where Ignatius’ spiritual pilgrimage took years, ours took just a week. Ignatius spent 11 months in the cave at Manresa writing The Spiritual Exercises — we spent just an hour celebrating Mass there. Ignatius walked hundreds of miles in simple leather shoes with little protection from the elements, while we covered only a few miles a day, all with the comfort and convenience of modern footwear. And yet, despite all these differences, there’s no doubt that all of Creighton’s travelers gained over the trip a similar sort of spiritual renewal and grace. During our final Mass at a chapel in St. Peter’s Basilica at the Vatican, Fr. Hendrickson in his homily called travelers to reflect on and share a single word that summarized our trip through key sites from Ignatius’ life. Insightful, spiritual, impactful: Whatever the word shared, it was clear that all of us were leaving the trip with a renewed perspective on life, and especially with a renewed perspective on how best to serve Creighton and live out the mission of Ignatius and the Jesuits.